Not all things social have to operate 24/7. Occasional moments for sleeping and eating are recommended for most social media teams. And while social media can turn on a dime, a great number of posts occur with careful planning, not whip-smart thumb action. So why not schedule Tweets in advance? When you’re planning out a social calendar, some posts are written weeks in advance. Avoid missing a post on a hectic work day, and take your planning a step further by scheduling your Twitter posts in advance. You have two options when it comes to scheduling tweets natively on Twitter. You can do it via the creatives tab (you must have a credit card on file to access the creatives tab), or the tweet composer at the top right of ads.twitter.com. To get started in your ads account, click the new tweet button at the top right of the tweets manager within the creatives tab. When the tweet box pops up, craft your tweet—include any image, location tag, or card you want. Delivery. Choose Standard to deliver your tweet organically (to all followers), or choose Promoted-only to deliver your tweet to users as part of a promoted tweet campaign. Promotion. Decide whether you want to add your tweet to an existing promoted tweet campaign. Scheduling. You can choose to Tweet to post immediately, or select Schedule or Save Draft if you want to edit your post later. With the Schedule option you’ll be asked to select a publishing date and time (up to one year in advance). Want more scheduling options? Try another an app like Hootsuite. 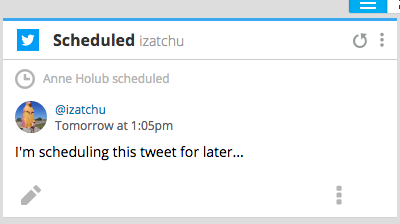 Scheduling tweets on Hootsuite lets you get more granular with your scheduling options. With Hootsuite you get more ways to draft, schedule and review your scheduled tweets all in one application. You can also schedule bulk tweets in one fell swoop. Sign up for Hootsuite. There’s a free plan if you’d like to start there. Add your Twitter profile or profiles to your dashboard. Create your tweet in the Compose Message box. Click the Scheduling calendar icon. Select the date and time you’d like to post your tweet. Or choose Auto Scheduler to let Hootsuite decide the optimal time to post your tweet. If you want to receive an email when your scheduled tweet has been published, check the notification box that says Email me when message is sent. Click Schedule, or under Save select Save as draft or View drafts if you’d like to save your post progress to edit later. 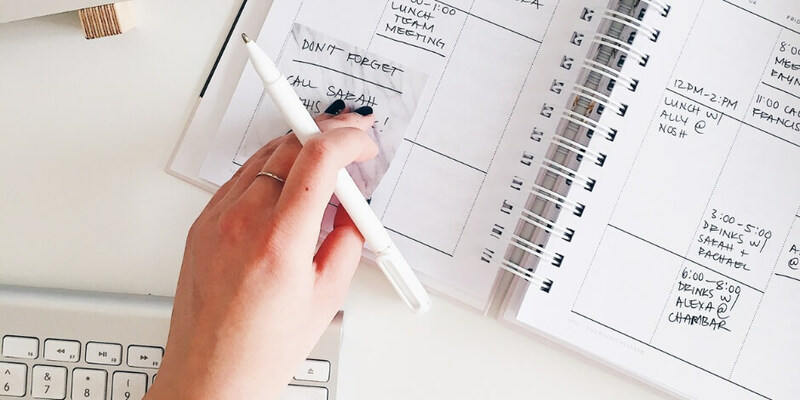 Bulk scheduling can be a great plan if you’re an organized social media guru with a spreadsheet full of tweets ready to go! Build anticipation about an upcoming event or launch, or just get your month’s tweets uploaded without all the extra clicks. The Hootsuite Bulk Composer is available to professional, team, business, and enterprise plans. It lets you import and schedule up to 350 tweets at one time from a handy .csv file. Start with your tweets in .csv file format. You can create these files with Google Docs, TextEdit (1.7 and above) or TextWrangler. Note: Excel files do not work. You’ll need three columns in your .csv file—one for the date and time, one for the message itself, and one where you can include a URL if you want to. Make sure that smart quotes are disabled if you’re using TextEdit and/or a Mac keyboard, as they can cause bulk scheduling to fail. If you already have tweets scheduled before you upload your .csv file, you should check how many you have and subtract that number of tweets in the .csv file you’re uploading. For example, if there are 100 tweets already scheduled, you can bulk upload 250 tweets in the .csv file. Select the Publisher airplane icon from the launch menu. Under Content Sources, click on Bulk Message Upload. Select the .csv file you want to upload and click Open. Choose the date format used in the .csv file. Select Twitter and click Submit. If the Bulk Composer detects any formatting errors or duplicate tweets, it will bring your attention to the issue by displaying a red banner. Fix any problem tweets before final send-off. To preview a tweet, click the Preview button in the top-right corner. Woop! That’s it! You just did a ton of work all at one time. Go get yourself a latte, and maybe even a cookie. 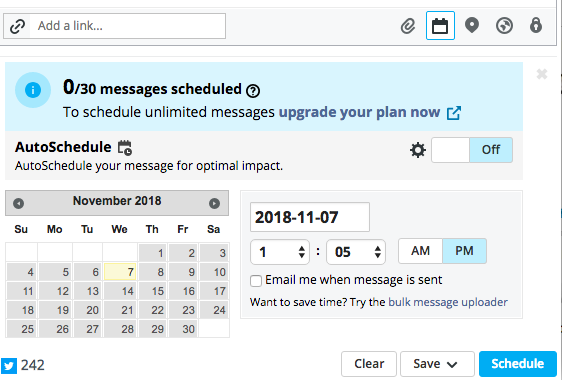 Auto scheduling is a great Hootsuite option when you want to post messages to multiple networks, like sending one message to Twitter in the morning and one to Facebook in the afternoon. Select a social profile from the Social Profile Picker (top-left). Click Compose message, and then enter your message. Click the toggle button to turn AutoSchedule On, and then click AutoSchedule. In the compose message box, click Scheduling. Click the toggle button to turn AutoSchedule Off. Want to edit your posts before they go live? Add media, edit copy or add a location to your scheduled tweets from the Hootsuite dashboard. Hover your mouse over the message or video, and then click Edit. Modify the message, and then click Save Changes. NOTE: When a message is edited from a Scheduled Stream for a specific social network, only the message being published to that social network will be changed. If you want to view scheduled posts within all your streams, simply scroll to the stream titled Scheduled and then scroll down to see all your scheduled tweets in chronological order. Is your audience global or local? Keep time zones and engagement habits in mind when you’re scheduling posts. Are they busy workers who only check Twitter during their evening commute? Do they like to kill time scrolling their feed during brunch on weekends? Use what you know to inform your scheduling decisions. If you want help sorting out your audience, check out our guide to creating audience personas. When you are well tuned to your users’ patterns of engagement, you’ll already have great insights about post timing and content that will yield the best engagement. Learn more about the numbers (and what they mean) from our Twitter analytics guide. Tweet properly and you’ll see your engagement numbers grow. We’ve done a lot of the hard number crunching for you and found that the optimal time to post to Twitter is 3 p.m. Monday-Friday. Read more Hootsuite picks for the best social posting times. Just because tweets are scheduled doesn’t mean you shouldn’t pay attention to them. If there’s a newsworthy event, you’ll want to pause or delete scheduled tweets to avoid any social faux pas. You don’t want to be posting about relaxing on the beach the same morning a hurricane blows in! Remember: before you start scheduling all your tweets, you’ll want to create an effective Twitter marketing plan. We can help with tried and true Twitter tips, tactics, and strategies. Use Hootsuite to schedule tweets, monitor relevant conversations, and engage your followers. Try it free today. Anne Holub is a poet and writer who knows way too many Simpsons quotes for her own good. She lives and writes in Montana with her husband and their two dogs, Merle and Rosie.